Venetoclax (VEN) is a potent and selective small molecule BCL2 inhibitor, with activity both as a single agent in relapsed/refractory AML, and in frontline combinations with hypomethylating agents and low-dose cytarabine. The ability of VEN to reduce the apoptotic threshold indicates it may be effective in combination with genotoxic agents which induce apoptosis, such as the FLAG-IDA regimen. A Phase 1b/2 clinical trial was designed to assess the safety and efficacy of VEN in combination with FLAG-IDA induction/consolidation. The primary safety endpoint was the overall incidence and severity of adverse events by CTCAE criteria. 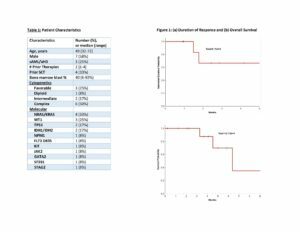 The primary efficacy endpoint was ORR by modified IWG AML criteria, and defined as CR, CRi, and PR. 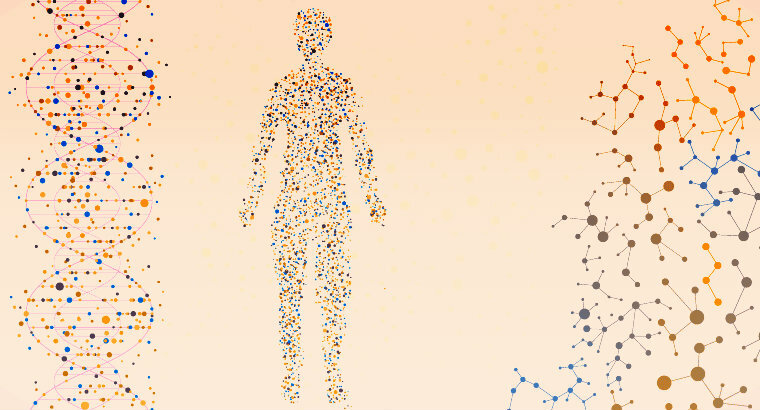 Secondary analyses include duration of response (DOR) and overall survival (OS), and exploratory analyses include gene expression signatures by RNA sequencing. Eligibility for the Phase 1b portion includes medically fit, relapsed/refractory (R/R) AML patients of any age with adequate organ function and ECOG PS ≤ 2. Patients receive FLAG-IDA induction/consolidation, in combination with VEN orally daily. FLAG-IDA induction for R/R AML consists of fludarabine 30 mg/m2 IV days 2-6, cytarabine 2 g/m2 IV days 2-6, idarubicin 6 mg/m2 IV days 4-6, and filgrastim 5 mcg/kg daily days 1-7 (or peg-filgrastim 6 mg after day 5 to replace remaining injections). The first cohort (dose -1) received FLAG-IDA with VEN 200 mg on days 1-21 of induction, incorporating a 2-day VEN dose ramp up. After the observation of gram-negative bacteremia and/or sepsis in 5 of the first 6 patients during cycle 1 nadir, an amended dose level -1 induction was designed with VEN 200 mg on days 1-14 and cytarabine 1.5 g/m². After completion of induction/consolidation, single-agent VEN at 400 mg orally continuously is provided as maintenance for patients not proceeding to SCT. The data cutoff for this analysis was 7.26.2018. Twelve patients with a median age of 49 years (range 32 - 72) have been enrolled. All patients had relapsed/refractory AML with a median of 2 (range 1 - 4) prior treatments, and four (33%) patients had received ≥1 prior allogeneic SCT. Six patients (50%) had complex cytogenetics, 3 (25%) were intermediate risk, and 3 (25%) were favorable risk. Additional demographics including molecular annotation at study enrollment are provided in Table 1. The median number of FLAG-IDA + VEN cycles received is 2 (0.5 – 3). Severe adverse events regardless of causality were neutropenic fever/bacteremia (n=5), pneumonia/lung infection (n=4), sepsis (n=4), typhlitis (n=1), and hypotension (n=2). All cases of sepsis occurred in the original dose -1 cohort. No early mortality was observed on study (30-d and 60-d mortality 0%). Of 12 patients, one remains too early for response assessment. 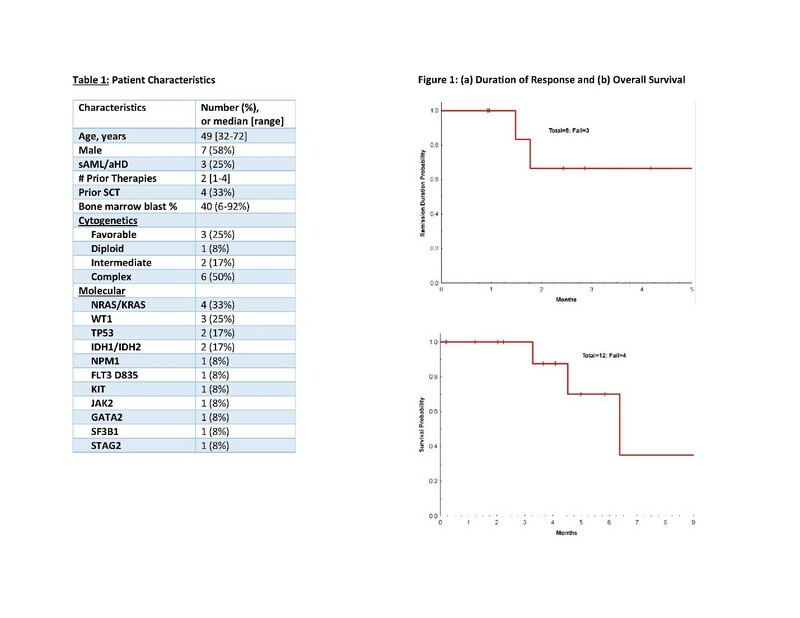 Of 11 patients, 8 patients (73%) achieved a best response of CR/CRi (7 CR, 1 CRi). Seven patients attained a best response within the first induction cycle, and one attained blast reduction after cycle 1 followed by CR after re-induction. Median time to ANC recovery > 500/ul in responding patients was 28 days (range 23 to 33 days). Of the 8 responding patients, three patients proceeded to allogeneic SCT, 2 remain on study, 2 patients relapsed, and 1 patient died in CR. Figure 1 depicts OS and DOR. With a median follow-up time of 4 months to date, median DOR has not been reached and the 6-month OS is 67%. NGS evaluation of RNA at pre-treatment and end of cycle 1 (EOC1) timepoints demonstrated no significant difference in BCL2 expression, either before/after therapy per patient, or based on clinical response. 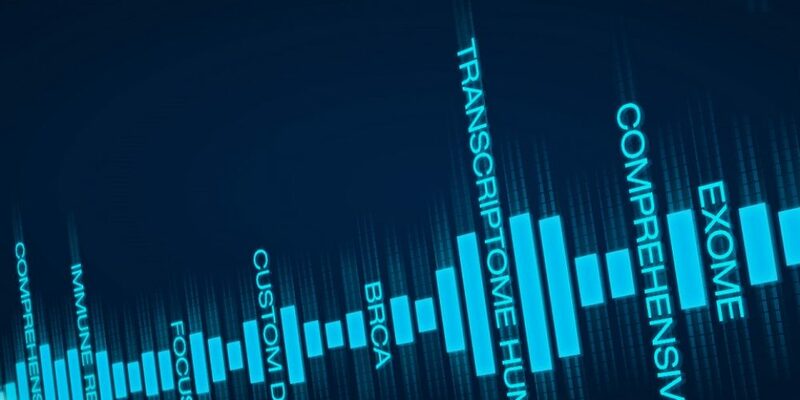 In patients who failed to achieve CR/CRi, significantly lower EOC1 expression (p=0.05) of BAX, BCLXL, BCL10, BCL2A1, BCL3, BCL9, TRS1, and TP53 was identified. Additionally, increased MCL1 expression at EOC1 was significantly (p=0.04) associated with relapse. Conclusion: FLAG-IDA chemotherapy with venetoclax demonstrates notable activity in a heavily pre-treated and R/R yet medically fit patient population. Neither prolonged cytopenias nor early mortality was observed. The ongoing Phase 1b portion aims to establish the best VEN dose in combination with intensive chemotherapy, to be followed with a Phase 2 portion with treatment arms for both newly diagnosed and R/R AML patients.